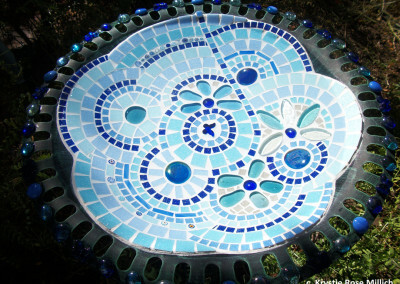 Tile, Glass, and Mixed Media Mosaic Artwork; Public, Commercial, and Residential Mosaic Projects. Krystie Rose Millich is an award-winning Mixed Media Mosaic Artist and Educator working and living in the Denver, Colorado area. 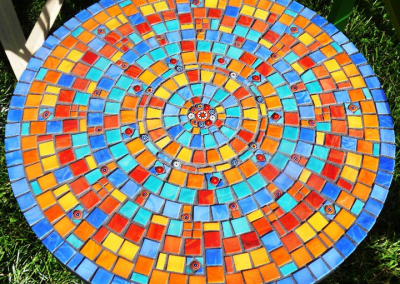 Krystie Rose creates original and custom mosaic artwork for exhibits, individuals, residences, businesses, and public entities and has been a full-time artist and educator since 2009. She has a great love for the vibrant, colorful art palettes of the world, especially in Mexican art, imagery, and folklore as well as the colors of India and its art. 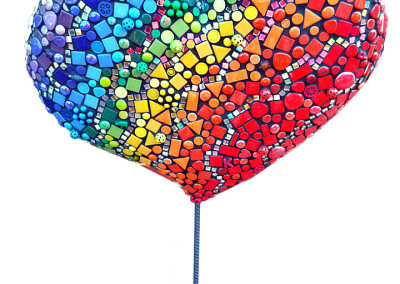 Krystie Rose has always had a love of collage, sculpture, and assemblage and these styles very prominently display themselves within her mosaic mixed-media work. She works to blend these parts of her world and make bright, happy, and inspiring art. Krystie Rose is available for commissioned work. If you would like to inquire about a project or just get in touch to chat, leave your name, email, and a message and we'll get back to you right away.